The goal is to design an identity for a fictional restaurant. Grilla Grill is a Korean restaurant with a jungle theme aimed at families. I made illustrations that would be fun and friendly to kids. 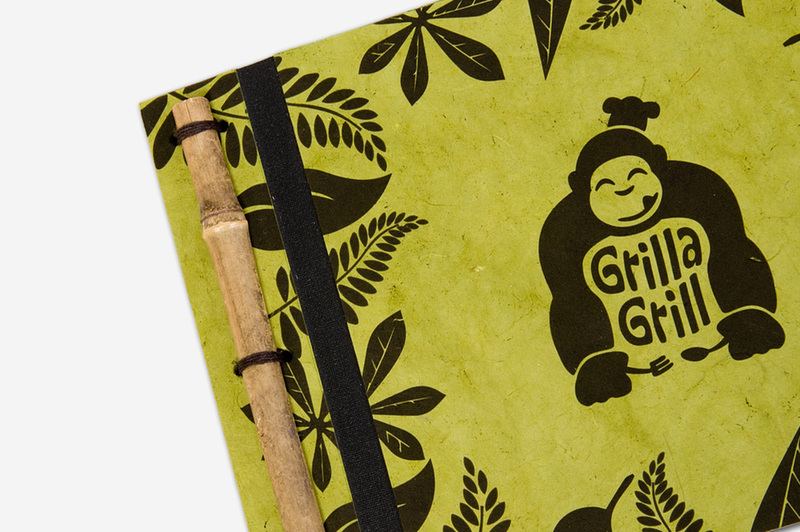 Each section in the menu has a different color and the gorilla's face changes to represent what kind of food is being served. 이 프로젝트의 목표는 허구의 레스토랑을 브랜딩하는 것이었습니다. Grilla Grill은 가족들을 위한 정글테마의 레스토랑입니다. 재미있고 친숙한 일러스트레이션을 만들어 아이들에게 더 재미있는 공간을 체험하게 하였습니다. 메뉴는 음식의 종류에 따라서 고릴라 얼굴 일러스트레이션이 다르고 종이색깔도 다르게 만들었습니다. Materials used in this projects such as bamboo sticks make customers feel comfortable and interested in exotic food. 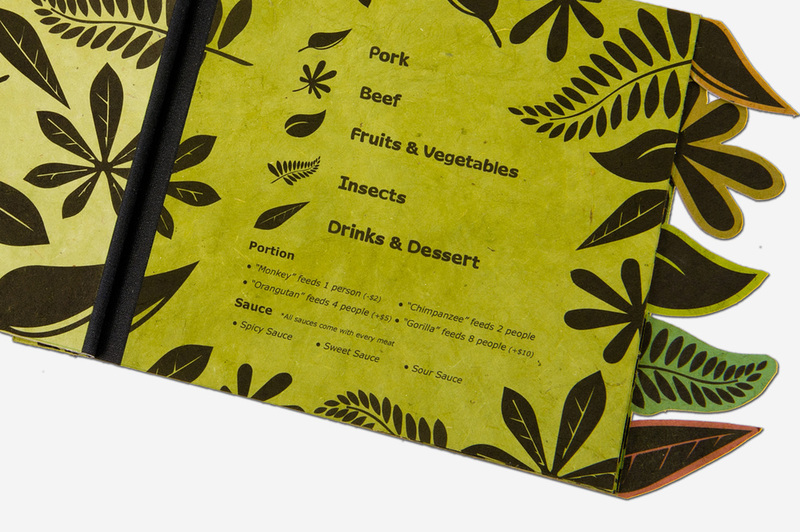 Green rice paper is used to incorporate jungle look and feel into the project. Different flavor sauces are not only for tastes but also for visual purpose. These sauces are served in hand-made jungle box with banana leaves in it. 대나무 같은 재료를 사용함으로써 손님들의 기분을 편하게 만들고 이국적인 음식에 흥미를 갖게 하였습니다. 정글의 느낌과 모습을 느낄 수 있게 초록색 라이스 페이퍼를 사용했습니다. 여러 종류의 소스들은 맛뿐만 아니라 시각적인 목적으로도 만들었고 이 소스들은 바나나 잎들이 담긴 수제 정글 박스에 넣었습니다.